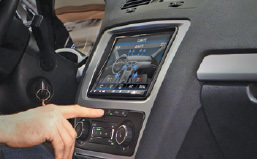 The INFODAPTER allows vehicle information such as climate control, parking sensor and heated seats to be displayed on any aftermarket AV head unit. 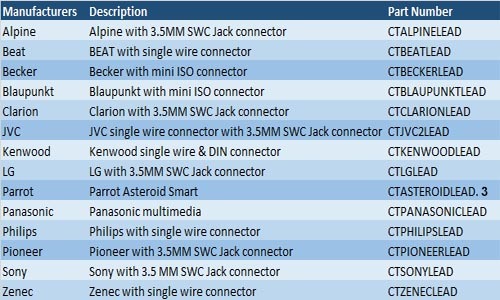 This information would usually be displayed on the original head unit and therefore would not be retained without use of an Infodapter. 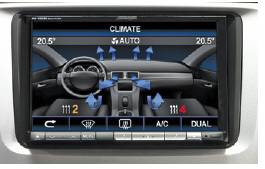 The infodapter connects to the rear camera input and also maintains steering wheel control functionally. Just plug the connections for the factory head unit inti it, the plug the box into your new in-dash device. It even has inputs for the reversing camera itself and also the standard steering wheel controls, retaining the functions you had before. Geeting too hot? Then you will want to tweak the climate controls. With the new AV head unit fitted, and the infodapter connected, just hit the control buttons as normal. Graphical confirmation, displaying temperature and other settings, now appears on-screen, making use of the Infodapter's owbn unique graphical style. The graphics make it easier to keep an eye on your settings – a handy function to retain, which without the Infodapter would have been lost when fitting the new head unit.The temperature-controlled seats work the same way. Just press the buttons as normal, and the graphics appearing on-screen will keep you up-to-date with their settings. To try the other main function retained by the Infodapter, just put the car into reverse as shown. With the car’s original head unit, the driver will be used to checking a graphical interpretation of the vehicle on-screen, and its distance from objects and other cars also shown. This is used to help him park the car in addition to the beeps. With the Infodapter fitted, there is nothing to worry about. Up pops the relevent screen, and the driver is able to see the car and work out how far he is from different obstacles. 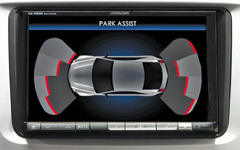 Safe parking is guaranteed with the new AV head unit, simply by fitting the Infodapter. 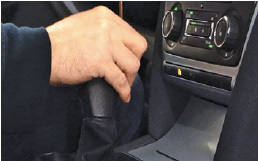 Slipping the car out of reverse returns the screen to the radio, film or navigation functions. Note 1. Not for UK vehicles. Note 2. For European models with 5" display only. Note 3. Retains steering wheel control functions, parking sensor audio/visualisation and allows time/date to be set from the steering wheel controls.